It is possible that the earliest “Resurrection” image was symbolic rather than literal. Literal images showing the resurrection of Jesus — and actually depicting Jesus — came later. In the catacombs are found a number of depictions of Jonah and the Sea Monster (later just called a “whale”). They appear to have been used as images signifying resurrection from the dead. “Then certain of the scribes and of the Pharisees answered, saying, Master, we want to see a sign from you. So what the addition of Matthew has done is to transform the Markan “no sign” into a supposed prophecy — the “sign of Jonas” then signifying that just as Jonah/Jonas was three days and three nights in the belly of the sea monster, so the Son of Man — meaning Jesus himself — would be “three days and three nights in the heart of the earth.” This of course refers to the burial of Jesus, which was then — in the biblical accounts — followed by his resurrection. “And when the people were gathered thick together, he began to say, This is an evil generation: they seek a sign; and there shall no sign be given it, but the sign of Jonas the prophet. “…for they repented at the preaching of Jonas; and, behold, a greater than Jonas is here” (Luke 11:32). Nonetheless, in early Christian art, when we see Jonah being expelled from the mouth of the sea creature after his “three days and three nights” inside the creature, we are seeing what is likely the first symbol of the Resurrection in Christian art — but applied not just to the resurrection of Jesus, but to that of the deceased Christian believer in general, as following the model of Jesus. And by the way, I will leave aside here the disputes over how the “three days and three nights in the heart of the earth” can or cannot be made to fit the Gospel accounts (which add up to Friday night, Saturday, and Saturday night) of when Jesus was buried and resurrected, and the various attempts made to adjust the matter. Suffice it to say that the biblical chronology makes a literal “three days and three nights” impossible. When examining the origins of early Christian art — and the later appearance of icons as venerated images — we must be careful to make precisely that distinction: between the image used as symbol and/or narrative illustration, and the image used as venerated icon. As I have pointed out in previous postings, Christian icons developed on the fringes where Christianity met non-Christian polytheism, and the former, over time, increasingly borrowed the venerated image from the latter and adopted it into Christian usage. The use of venerated icons in Christianity was never without controversy, and it took many centuries before icons were officially accepted in the church, and before a theology was created to excuse them. But what of Christian art before the venerated icon? It consisted largely of symbols and of narrative images. That is what we find in the earlier Christian catacombs. The subjects mentioned by Clement were extremely common on the everyday seal market as used by polytheists, but can generally (as he suggests) be given a Christian interpretation. Note that he forbids images of “idols,” which to him meant any of the deities of the polytheists. Note also that he does not suggest any images of Jesus or of saints that would have had to be specially made — though he permits generic images that may call such to mind — for example a fisherman, which could remind a Christian both of Peter the Apostle and fisherman, and of baptism. But the fisherman here is a symbol, not an iconic representation of Peter. We find many symbolic and narrative images in the early Roman catacombs, and in fact that is what the first Christian art was — symbolic or narrative, or a combination of both — not the venerated icons that came later. That is not surprising, given that narrative images were already to be found here and there in Jewish art of the 3rd century — itself subject to, and the result of, Hellenistic Greek influence. In fact the representational use of art as found on the 3rd century Dura Europos synagogue walls is characteristic of other religions (polytheistic) of the time, and borrowed by Jews for their own purposes. We see that syncretism, for example, in the western wall of the Synagogue at Dura Europos, which has a surprising depiction — Orpheus taming the animals with his music, borrowed directly from Greco-Roman mythology. That shows us the extent to which Jews — and also, we shall see, Christians — borrowed motifs from “pagan” Hellenistic mythology and used them as symbols to refer to figures in their own religious traditions. In the Dura synagogue, for example, the Orpheus figure is used to remind one of King David — a symbol, in other words, borrowed from the Hellenistic and polytheistic culture, and used much as Clement used a fisherman to call to mind both the apostle Peter and Christian baptism. Hellenistic influence extended not merely to art, but also to Jewish and Christian theology. Think, for example, of the allegorical biblical interpretations of the Hellenistic Jewish writer Philo of Alexandria (c. 30 b.c.e- 50 c.e. ), and his discussion of the Logos, the emanation of the hidden God, which is very much the Logos (“In the beginning was the Word…” John 1:1) doctrine found in the Gospel called “of John”. There are other examples from elsewhere of the Jewish use of the Orpheus image during this period. We find Orpheus images used also in a Christian context in the Roman catacombs, as well as the image of the sun god Helios/Apollo, again used in a symbolic sense to call Jesus, the “sun of righteousness” to mind — another “polytheistic” image borrowed and given a Christian significance. It is hardly necessary to mention yet another common image from polytheistic culture — the Kriophoros or ram-bearer, which was borrowed into the earliest Christian art to signify Jesus, the “Good Shepherd.” One could add more Christian borrowings from the art of the polytheistic culture surrounding them that are found in the art of the early catacombs — and in the first Christian art in general. In fact — because the same images may be found used both by polytheists and as Christian borrowings, context is important in distinguishing one from the other. So the religious image as symbol or narrative is found in the art both of Judaism and of early Christianity — but the venerated icon as understood in later Eastern Orthodoxy is something else entirely, and should not be confused with the art of the early Christians as we find it in literature and in the archeological record. It is convenient for our purposes that a Christian Church was also found at Dura, and it too had art, though not nearly as sophisticated as that in the Dura synagogue. It is here that we find what may be the earliest-known representation of Jesus, shown as a typical classical figure, healing the paralytic. We find also the “Good Shepherd” image, what is apparently a representation of Jesus and Peter “walking on the water,” and also an image generally interpreted as the women coming to the tomb after the resurrection. All narrative/symbolic images, representing biblical stories. So early Christian symbolic/narrative art must be distinguished from the later venerated Christian icon as found in Eastern Orthodox art. Hellenistic, polytheistic culture influenced both early Christian (and Jewish) art of second and third centuries c.e., so it is an egregious error to imagine that Christian art developed free of influence from its polytheistic environment. Nonetheless, the venerated icon that later developed in Christianity was a significant step beyond the use of narrative and symbol in art; it was the adoption of the polytheistic practice of veneration of images of the gods into Christianity, transferring that veneration of the heavenly hierarchy to Jesus and the saints — a significant distinction that is often overlooked in “religious” discussions of the origins of Christian iconography and of Christian venerated icons. It is a serious historical error to confuse early Christian art with later Christian venerated icons. Though both consist of images, they are completely different in context and significance. In earlier postings, I noted that the making and veneration of icons (as the term was later understood in Eastern Orthodoxy) was not an “official” part of earliest Christianity, but rather came into it later, on the fringes of Christianity as it spread out of Judaism and into the polytheistic Greco-Roman world. The use of icons came from polytheistic religious practice into Christianity gradually (and not without controversy), only being accepted officially as part of Church practice centuries later. That is why the first evidence we have of icons being venerated as sacred images is found in that border where polytheism meets Christianity, the latter being influenced by the former. There were various kinds of votive gifts to the deities, but often they were images. One could donate a clay image of the deity, a stone or bronze statue small or large, and one could even donate a shrine or temple to house such images. Among these votive gifts were painted panels depicting the deity or deities. They could be donated to a temple, or placed in a home shrine. These panels are ancestors of the later Eastern Orthodox icon. The practice of venerating such images of the gods in polytheistic practice, whether in home or temple, involved honoring them with lights, and with wreaths, crowns, and garlands woven of flowers and foliage. There came together therefore a gathering of a great multitude on John’s account; and as he discoursed to them that were there, Lycomedes, who had a friend who was a skillful painter, went hastily to him and said to him: You see me in a great hurry to come to you: come quickly to my house and paint the man whom I show you without his knowing it. And the painter, giving some one the necessary implements and colors, said to Lycomedes: Show him to me, and for the rest have no anxiety. And Lycomedes pointed out John to the painter, and brought him near him, and shut him up in a room from which the apostle of Christ could be seen. And Lycomedes was with the blessed man, feasting on the faith and the knowledge of our God, and rejoiced yet more in the thought that he should possess him in a portrait. The painter, then, on the first day made an outline of him and went away. And on the next he painted him in with his colors, and so delivered the portrait to Lycomedes to his great joy. And he took it and set it up in his own bedchamber and hung it with garlands: so that later John, when he perceived it, said to him: My beloved child, what is it that you always do when you come in from the bath into your bedchamber alone? do not I pray with you and the rest of the brethren? or is there something you are hiding from us? And as he said this and talked jestingly with him, he went into the bedchamber, and saw the portrait of an old man crowned with garlands, and lamps and altars set before it. And he called him and said: Lycomedes, what do you mean by this matter of the portrait? can it be one of your gods that is painted here? for I see that you are still living in heathen fashion. And Lycomedes answered him: My only God is he who raised me up from death with my wife: but if, next to that God, it be right that the men who have benefited us should be called gods -it is you, father, whom I have had painted in that portrait, whom I crown and love and reverence as having become my good guide. And John who had never at any time seen his own face said to him: You mock me, child: am I like that in form, [excelling] your Lord? how can you persuade me that the portrait is like me? And Lycomedes brought him a mirror. And when he had seen himself in the mirror and looked earnestly at the portrait, he said: As the Lord Jesus Christ lives, the portrait is like me: yet not like me, child, but like my fleshly image; for if this painter, who has imitated this my face, desires to draw me in a portrait, he will be at a loss, [needing more than] the colors that are now given to you, and boards and plaster (?) and glue (? ), and the position of my shape, and old age and youth and all things that are seen with the eye. But do you become for me a good painter, Lycomedes. You have colors which he gives you through me, who paints all of us for himself, even Jesus, who knows the shapes and appearances and postures and dispositions and types of our souls. And the colors wherewith I bid you paint are these: faith in God, knowledge, godly fear, friendship, communion, meekness, kindness, brotherly love, purity, simplicity, tranquillity, fearlessness, grieflessness, sobriety, and the whole band of colors that paint the likeness of your soul, and even now raise up your members that were cast down, and levels them that were lifted up, and tends your bruises, and heals your wounds, and orders your hair that was disarranged, and washes your face, and chastens your eyes, and purges your bowels, and empties your belly, and cuts off that which is beneath it; and in a word, when the whole company and mingling of such colors is come together, into your soul, it shall present it to our Lord Jesus Christ undaunted, whole (unsmoothed), and firm of shape. But this that you have now done is childish and imperfect: you have drawn a dead likeness of the dead. What we see in this early pious tale is the making of a Christian icon by a former “pagan” who just adapts his old religious practice to new Christian circumstances. And that is precisely how Christian icons began — with the changing of the gods from pagan polytheism to Christian polytheism — the veneration of Jesus and Mary and all the growing panoply of saints who became the new gods in practice, if not in terminology. So again we have an association of the making of images with the traditional practices of “pagan” polytheists — though three dimensional art fell out of favor in later Eastern Orthodoxy, the panel painting survived as the Christian icon. “They also possess images, some of them painted, and others formed from different kinds of material; while they maintain that a likeness of Christ was made by Pilate at that time when Jesus lived among them. They crown these images, and set them up along with the images of the philosophers of the world that is to say, with the images of Pythagoras, and Plato, and Aristotle, and the rest. They have also other modes of honoring these images, after the same manner of the Gentiles [‘pagans’]”. WHEN DID CHRISTIAN ICONS BEGIN? The central part of the image is a depiction of the Hodegitria icon supported by two angels, depicting Mary as “Shower of the Way,” which was considered a very important icon in Byzantium and another of those icons said (mistakenly) to have been painted by St. Luke. The crowned figures at left are the Byzantine iconophile Empress Theodora and her son Michael III, as well as various iconophile saints. Not all the saint titles are clear in this image, but later examples of the type usually include such figures as Methodius the Patriarch of Constantinople, Michael Bishop of Synnada, Tarasius Bishop of Constantinople, St. Theodosia, Venerable Ioannikos, Theodore Studite, Theodore Graptus, and Stephen the New. The embroidered ornamental cloth hanging just below the icon is called a podea (ποδέα) in Greek, and in Russian a pelena (пелена). Now to the history of the development of the icon out of the Christian image. Contrary to traditional Eastern Orthodox belief, icons do not go back to the earliest days of the Church. They were a later and gradual development only officially adopted centuries after the first Christians. In examining this history, we must distinguish between images (art) and icons (venerated images). 3rd century (200s): The first recognizably Christian art appears in motifs borrowed from common non-Christian art and appropriated for Christian use, as well as in simple depictions of some Old and New Testament subjects. Examples are found on oil lamps, in Roman burial catacombs, and in the house church at Dura Europos in Syria. Depictions of persons use generic features common to Roman art of that period. 4th century (300s): This century — particularly the latter half of the 4th century — is a crucial period that laid the foundations for the eventual change in attitude from art image to venerated icon. In 313 Christianity is legalized in the Roman Empire by Constantine and Licinius through the Edict of Milan. Elaborate churches are built under imperial patronage. The first individualizing portrait images of Jesus, Mary, and other saints and martyrs appear and art becomes gradually more sophisticated and elaborate. We see the beginnings of images of saints being regarded as not only commemorative, but also protective. Basil of Caesarea, in speaking of images of the Emperor, says that the honor given an imperial image passes to its prototype (the Emperor). With the veneration of the Christian martyrs in the catacombs, the cult of relics begins as healing and intercessory powers are attributed to body parts of dead saints and items that had contact with their bodies. Relics spread throughout the empire, often placed in elaborate containers (reliquaries). From 381-395 Theodosius begins and extends a ban on traditional non-Christian religious practices in public, closes and destroys “pagan” temples, and extinguishes many non-Christian traditional practices to eliminate “paganism” in favor of Christianity. In this century the halo, adopted from non-Christian use, first appears in Christian art, as do wings on angels, another adoption from non-Christian art. The cross in simple form appears, gradually replacing the chi-rho monogram as the century proceeds. 5th century (400s): The crucifixion first appears in Christian art near the beginning of the century. 6th century (500s): Relic images — three of the so-called “Not made by hands” images of Jesus — first come to prominence as having apotropaic (averting harm) and palladium (city protector) functions. It is in the 6th century that religious images first are found in church use, though generally still not permitted. 7th century (600s): Ex voto painted (etc.) images of saints are created in thanks for answered prayers. 8th century: The veneration and understanding of icons — the theology of icons — is first codified in Eastern Orthodoxy. The earlier “honor to the prototype” concept of Basil regarding images of the emperor is now applied — in a new context — to icons of Jesus, Mary, and the saints by John of Damascus and others. The Iconoclasts openly oppose the making and veneration of icons, rightly viewing image veneration as an innovation counter to the traditions of the church. The Iconoclasts are victorious for a time, having Imperial support, but with reign change that victory vanishes, and the views of the Iconophiles ultimately prevail. So that is the evolution of the icon made brief. This does not mean there were absolutely no images honored as Christian religious figures before the 6th century, but it does mean that this is the “mainstream” course of development. We have evidence of Christian images being treated in icon-like fashion first on the outer fringes of Christianity where it blended into “paganism,” such as the image of Christ said to have been kept in syncretistic fashion by Emperor Alexander Severus (222-235 AD)) together with other images of Orpheus, Appollonius of Tyana, and Abraham; We also have in the Apocryphal Acts of John (dating uncertain, usually in the 150-250 range) a condemnation of the creation of such images and the honoring of them with lights and decorations. Where there is condemnation there is use to some extent, but to repeat, this use is first documented in the fringe realm between “paganism” and Christianity. What all of this means for practical purposes is that the icon as it was regarded in the Eastern Orthodox Church from the 8th century onward did not really exist openly as such in the mainstream church until the latter part of the 600s, and its theology was not codified until the 700s, when those who refused to venerate icons were cursed (anathematized) in the official declarations of the Church. Thus the practice of icon making and veneration preceded the “official” doctrine made to justify the practice. This chronology, incidentally, is not intended to determine whether the making and veneration of icons is “right” or “wrong,” from any ethical perspective, because art history only deals with what was and is, and does not involve itself in such judgments. It is obvious, however, that from the perspective of Christian traditional usage, icons were a late innovation in the mainstream church, as the Iconoclasts declared. Art historians consider the first Christian art just an aspect of Roman art of the time, and the elaboration of Christian art under Emperor Constantine a continuation in Christian dress of more classical aspects of Roman art. My own view is that the making and veneration of painted religious images practiced in pre-Christian Roman society never really died out with the victory of Christianity, but continued on the fringes and in private; after the Edict of Milan and the condemnation of public “pagan” religious practice under Theodosius, the making and veneration of images gradually filtered into the mainstream church through the vast numbers of new “pagan” converts, though keeping largely in the shadows and not finding full and official acceptance until after the Iconoclastic controversies of the 8th century. 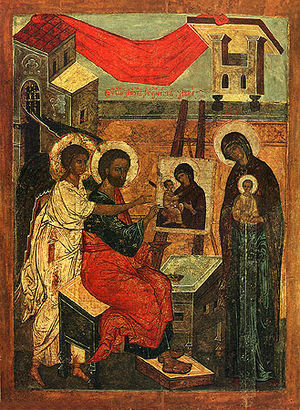 If one begins researching the icons of Mary called chudotvornaya— “wonderworking” — in the Russian Orthodox Church (and there are some in Greek Orthodoxy too, but not nearly as many), one will quickly notice that a number of them are said (with a straight face) to have been painted by St. Luke. Yes, Saint Luke, also known as the Evangelist Luke. On conservative E. Orthodox religious sites one will see this repeated over and over again about such icons as the Vladimir Mother of God (Vladimirskaya), which was even said to have been painted by Luke on a board taken from a table used by Jesus and his family. Well, it simply is not true. Not one bit of it. First of all, we do not know who really wrote the Gospel attributed to St. Luke. That attribution was added later. Nowhere does any author self-identify in that Gospel. None of the Apostolic Fathers, in quoting from a Gospel, attributes it to a named author, which would hardly have been the case if an author was known in those early days. So we can assume the Gospel called “of Luke” was anonymous in the earliest manuscripts (that applies to the other three Gospels as well — and also to the Acts of the Apostles; apparently the attribution titles were added sometime near the end of the 2nd century). What we do know is that the Gospel attributed to Luke contains not one word about the painting or veneration of icons. Nor is there the slightest mention of it anywhere in the New Testament where a “Luke” is mentioned — or anywhere in the New Testament at all. Not one of the icons attributed to Luke is in a style remotely connected to the 1st century A.D. All are much, much later (and from various later times chronologically). And there is not one bit of scientific analysis dating any one of the number of icons attributed to Luke to the 1st century. Where, then, does the notion come from that several icons of Mary were painted by Luke? First of all, it comes from the desire of the later church — after the making and painting of icons had become established practice (which was beyond the period of the earliest Christians) — to retroactively inject the later doctrine of icon making and veneration into earliest Christianity, where there is really no trace of it. Second, we may speculate that Luke was chosen as the prototypical first painter of Christian icons because, according to tradition, he was a physician — a doctor (“Luke, the beloved physician, and Demas, greet you.” [Colossians 4:14]) And early physicians used certain powdered medications that were also used in early and later painting — among them notably cinnabar, which provided the bright red-orange color we see in Russian icons. An additional factor is that the gospel called “of Luke” devotes considerably more attention to Mary than the other three. So no, there are no icons, wonderworking or not, painted by Saint Luke. Nor, we can tell from the history of the development of Christian art, were there ever any such icons. The earliest Christians simply did not paint and venerate icons as they are known later in the Eastern Orthodox Church, so attributing any icon to Luke is an obvious anachronism well known to be such by students of art history. In spite of that, the Greek Orthodox have a legend that Luke painted three icons of Mary during her lifetime, and that she personally approved them; then after her death, he is said to have painted an additional seventy! The Kykiotissa icon, which the Russians call Kikkskaya, now at the Kykkos Monastery on Cyprus. The Megalospilaiotissa or “Great Cave” icon (also called Speliotissa), now at the Megaspilaion Monastery in the Peloponnese, Greece. The Soumeliotissa icon, once kept at the Soumela Monastery in Turkey, now at the 20th-century “monastery” (actually the Dormition Church) in Greece (named after the Turkish site), at Kastania in Macedonia. As a sidelight on the famous “Vladimir” icon pictured on this page, it is interesting to know that out of the whole painting, only the face of the child (not the rest of his head) and the face of Mary remain from the original painting, along with a couple of other small and insignificant patches. The rest — which is the greater part of the icon we see today — is all later, all reworking. When I say the original painting, I am not talking about the 1st or 2nd or 3rd or 4th or even the 5th century C.E. I am talking about the 12th century, when the original icon was painted by an anonymous iconographer in Byzantium. This is the most famous supposedly “Lukan” icon, and yet in fact it was not painted until the 1100s, and most of what we see today was actually painted at various later times.